I feel it's a missed opportunity for learning and improving the reviewer base. If I want to scroll back through my browser history/list of recent reviews -- to see how other people interpreted the posts to either confirm I made a good judgement call or better understand where I may have gone wrong -- it would be very beneficial to be able to view the post in question if it were deleted. Right now there's no way to evaluate what you did wrong or didn't catch if you voted against the majority on a post that gets removed unless you have +10k rep to see the post (as you would normally be able to for any deleted post) or by having an eidetic memory. @Sam pointed out that, at least for posts that were able to survive long enough to get scraped and cached, it is possible to use one of any number of web caching services. While this is true I believe I'm right in assuming that the vast majority of posts that get the deletion treatment are caught early and never get the opportunity to live on in infamy. As such, while it's a hit or miss workaround for the way things currently are it is certainly not a great solution to be suggested to people to use in the future. Currently this is how things appear for those below 10k for those above it. Following @DanNeely's point below about reducing my initial lower limit of 2k to 500 as these users have access to review queues where this may also occur has got me asking why not open the viewing of all reviews to any registered user? Insight to and an improved transparency of how the community makes its decisions in relation to unwelcome material can only benefit any user that may want to see the process in action and thus lead them into making better decisions themselves about how they formulate their own posts and submitting flags that are more in line with how the community is actually acting upon flags. If it were a question of hiding people's names from possible revenge type voting or harassment from low-rep users who have not proved they can act appropriately on the site then of course, keep a lower rep limit or mask them for user who wouldn't ordinarily be able to see them. So I guess after some back and forth in the comments and a few edits the proposal has a few main points or choices. 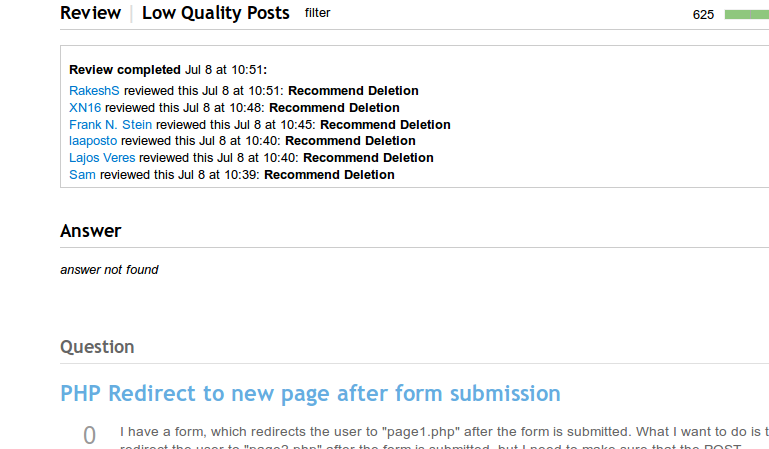 Allow any user to see a deleted post that they performed a review action on (including skip!). Allow any user of sufficient rep to view a deleted post when viewed through a review link (not by normal in-line Question/Answer links). 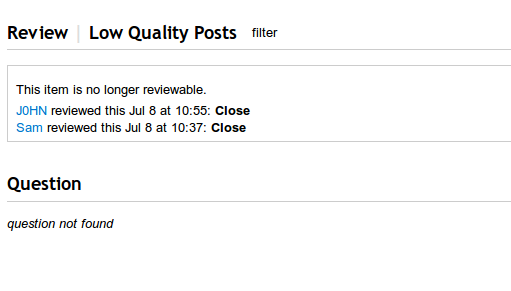 Allow ANY user (optionally registered/logged in) to view a deleted post when following a review link. Brad has pointed out that he has a similar request for this on meta.SE with further reasoning from a moderator's perspective. So moderators just got the ability to provide custom reasons when they ban users from review. Often, these bans are due to specific very bad reviews, like approving spam or non-answers. It will be common for us to give links to these bad reviews in the ban message that the reviewers will be presented with. I propose that reviewers of any reputation level be able to see posts that they reviewed, even ones that were later deleted, if they are presented with a link to their review. They already saw the post once, so there's no harm in showing it to them again, and reviewers are going to need to see why they made a bad call on a particular review. This wouldn't enable the original post to be visible directly. Not the answer you're looking for? 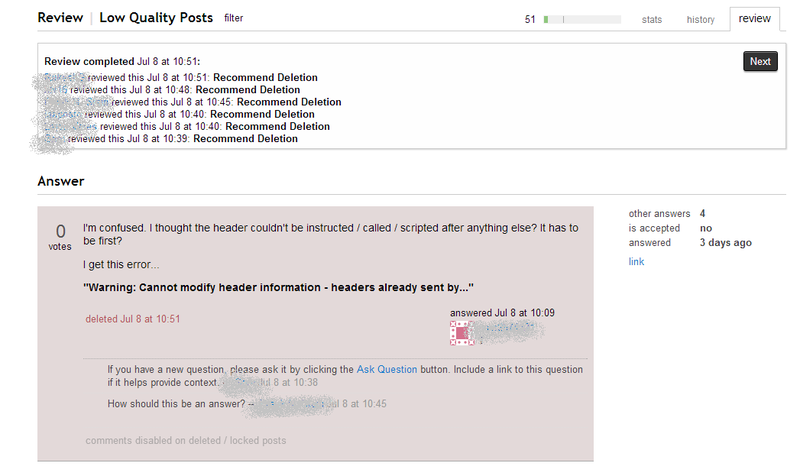 Browse other questions tagged feature-request review deleted-questions deleted-answers . Meta-Review Queue: But who will review the reviewers themselves? Am I doing Low Quality Post reviews incorrectly? Is it possible to allow edits on self-deleted posts by high rep users?